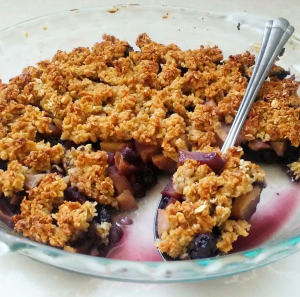 Healthy Apple Blueberry Crumble - No Way That's Healthy! The other day I got a huge bag of frozen blueberries and decided to use them for something other than a smoothie! I love blueberry pie but using 3-4 cups of blueberries is pretty expensive here so I thought I’d combine apples with the blueberries therefore requiring much less. (This combo also turns the apples a gorgeous color, how fun!) The recipe was a hit with my family and that’s why I’m sharing it with you. I serve it as dessert, but it’s even healthy enough to have for breakfast! Serve warm with some coconut whipped cream on top to make it even more amazing. ⅔ cup frozen blueberries, fresh will work too. Mix the filling together and place in baking dish. For easy clean up, place all the topping ingredients into a bag and shake. If too thick and not crumbly enough add a little more oatmeal.Crumble the topping all over the filling as evenly as possible, it's fine if some filling peeks through.Bake 350F covered for 30-40 mins until the apples and blueberries start to bubble and soften. Then uncover and bake an additional 15 or so till the top is golden and crispy.